Yoann Arquin grabbed a 92nd-minute winner as Hereford knocked Uwe Rosler's Brentford out of the Carling Cup. Sam Saunders, Clayton Donaldson, Shaleum Logan and Karleigh Osborne all tested home keeper Adam Bartlett as the Bees dominated the first half. But Arquin settled the tie from six yards in stoppage time following good work by Joe Colbeck. Brentford have now been knocked out in the first round in seven of the past eight seasons. "We came under the cosh in the first half but we rode out the storm and we've managed to nick one at the end. "Pre-season was about getting them fit and I would say that we finished the stronger in the end. "That is credit to us as a coaching staff and credit to the players for the hard work that they have put in." 90:00+5:16 The game is over, as the referee blows his whistle. 90:00+4:15 Jake Reeves takes the outswinging corner, Marcel Eger produces a left-footed shot from the edge of the box and misses to the left of the goal. 90:00+3:44 Inswinging corner taken from the left by-line by Jake Reeves, Robert Purdie makes a clearance. 90:00+3:44 Substitution Shaleum Logan leaves the field to be replaced by Gary Alexander. 90:00+3:29 Charlie MacDonald takes a shot. Ryan Green gets a block in. 90:00+1:51 Assist on the goal came from Joe Colbeck. 90:00+1:51 GOAL - Yoann Arquin:Hereford 1 - 0 Brentford Yoann Arquin fires in a goal from close in to the bottom left corner of the goal. 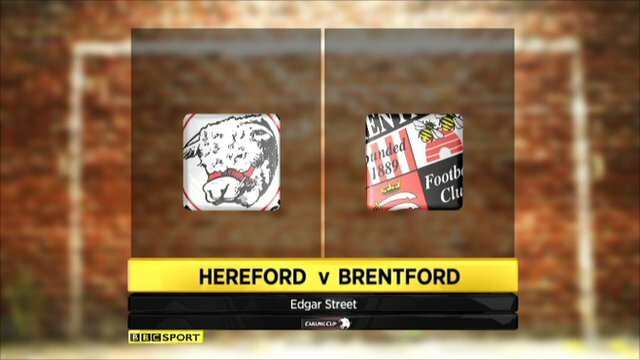 Hereford 1-0 Brentford. 90:00+1:06 Corner taken right-footed by Jake Reeves from the left by-line, clearance made by Robert Purdie. 90:00+0:54 Clayton Donaldson takes a shot. Ryan Green gets a block in. 89:11 The ball is delivered by Shaleum Logan, clearance by Robert Purdie. 88:29 The ball is sent over by Myles Weston. 87:54 The ball is sent over by Stuart Fleetwood, clearance by Marcel Eger. 87:04 Yoann Arquin is flagged offside by the assistant referee. Indirect free kick taken by Sam Wood. 86:35 Centre by Joe Heath, Yoann Arquin takes a shot. Simon Moore makes a save. 84:58 Marcel Eger takes the free kick. 84:58 Substitution (Brentford) makes a substitution, with Myles Weston coming on for Marcus Bean. 84:58 Free kick awarded for a foul by Yoann Arquin on Sam Wood. 84:02 Corner taken by James McQuilkin, save by Simon Moore. 82:34 James McQuilkin takes the outswinging corner, Harry Pell takes a shot. Save by Simon Moore. 82:21 Harry Pell takes a shot. Save made by Simon Moore. 82:09 The ball is swung over by Robert Purdie, Shaleum Logan makes a clearance. 81:01 Outswinging corner taken right-footed by James McQuilkin, save by Simon Moore. 79:13 The ball is swung over by Joe Colbeck, clearance by Karleigh Osborne. 78:11 The ball is swung over by Shaleum Logan, Ryan Green makes a clearance. 76:46 Yoann Arquin delivers the ball. 75:48 Close range effort by Clayton Donaldson goes over the bar. 75:04 Marcus Bean takes a shot from just inside the penalty box which clears the crossbar. 74:36 Substitution Jake Reeves on for Sam Saunders. 73:58 James McQuilkin decides to take a short corner. 73:23 The ball is crossed by Yoann Arquin, Karleigh Osborne manages to make a clearance. 73:04 Shaleum Logan crosses the ball, clearance by Harry Pell. 70:45 Corner taken by Sam Saunders played to the near post, Kenny Lunt manages to make a clearance. 70:28 Clayton Donaldson takes a shot. Blocked by Joe Heath. 70:13 Sam Wood delivers the ball. 69:45 A cross is delivered by Shaleum Logan, clearance by Robert Purdie. 69:21 The ball is delivered by James McQuilkin, Shaleum Logan manages to make a clearance. 67:24 Stefan Stam takes the direct free kick. 67:24 Substitution Yoann Arquin is brought on as a substitute for Delroy Facey. 67:24 Booking Jonathan Douglas goes into the referee's book. 67:14 Jonathan Douglas gives away a free kick for an unfair challenge on James McQuilkin. 66:48 Corner taken by Sam Saunders played to the near post, Kenny Lunt makes a clearance. 66:13 Clayton Donaldson takes a shot. Save made by Adam Bartlett. Kevin O'Connor takes a shot. Blocked by Ryan Green. 65:17 Handball by Joe Colbeck. Free kick taken by Simon Moore. 64:45 Charlie MacDonald gives away a free kick for an unfair challenge on Ryan Green. Direct free kick taken by Adam Bartlett. 64:06 The ball is sent over by Shaleum Logan, save by Adam Bartlett. 61:22 The ball is crossed by Marcus Bean, Robert Purdie manages to make a clearance. 60:37 The ball is crossed by James McQuilkin. 60:09 Sam Saunders sends in a cross, save by Adam Bartlett. 59:55 Stuart Fleetwood is caught offside. Shaleum Logan takes the indirect free kick. 59:42 Sam Saunders crosses the ball, clearance made by Harry Pell. 59:26 The ball is sent over by Karleigh Osborne, clearance made by Kenny Lunt. 58:56 Corner taken right-footed by Sam Saunders, Stefan Stam manages to make a clearance. 58:36 Clayton Donaldson takes a shot. Blocked by Ryan Green. 56:19 Harry Pell concedes a free kick for a foul on Kevin O'Connor. Direct free kick taken by Marcel Eger. 55:00 Sam Saunders produces a right-footed shot from just outside the box that misses to the right of the net. 52:22 Corner taken by Sam Saunders from the right by-line, Delroy Facey makes a clearance. 51:09 Charlie MacDonald sends in a cross, Robert Purdie makes a clearance. 49:09 Ryan Green gives away a free kick for an unfair challenge on Clayton Donaldson. Free kick taken by Sam Wood. 47:47 The ball is crossed by Joe Colbeck. 46:44 A cross is delivered by Joe Colbeck, Sam Wood makes a clearance. 46:30 A cross is delivered by Harry Pell, Karleigh Osborne makes a clearance. 45:00+1:16 The ref blows to signal half-time. 45:00+0:35 A cross is delivered by Shaleum Logan, clearance by Ryan Green. 44:20 Corner taken by Robert Purdie from the right by-line. 43:51 Harry Pell takes a shot. Karleigh Osborne gets a block in. The ball is sent over by Stuart Fleetwood, blocked by Sam Wood. 40:02 Sam Saunders takes the free kick. 40:02 Booking Booking for Joe Colbeck for unsporting behaviour. 39:42 Unfair challenge on Marcel Eger by Joe Colbeck results in a free kick. 39:34 Sam Wood delivers the ball, Stefan Stam manages to make a clearance. 38:25 Marcus Bean challenges Kenny Lunt unfairly and gives away a free kick. Stefan Stam takes the direct free kick. 37:44 Sam Saunders takes the inswinging corner, Kenny Lunt makes a clearance. 37:37 Sam Wood sends in a cross, clearance by Stefan Stam. 36:56 Foul by Stefan Stam on Clayton Donaldson, free kick awarded. Free kick taken by Marcel Eger. 35:24 Kevin O'Connor concedes a free kick for a foul on Joe Colbeck. Direct strike on goal from the free kick comes in from Stuart Fleetwood, Charlie MacDonald gets a block in. 34:57 Marcus Bean gives away a free kick for an unfair challenge on Kenny Lunt. Direct free kick taken by Adam Bartlett. 34:02 Outswinging corner taken by Sam Saunders, Delroy Facey manages to make a clearance. 33:53 Shaleum Logan produces a cross, blocked by Delroy Facey. 32:55 Handball decision goes against Kenny Lunt. The free kick is swung in right-footed by Sam Saunders, save made by Adam Bartlett. 32:48 Centre by Sam Wood, save by Adam Bartlett. 31:42 Shot from deep inside the area by Stuart Fleetwood clears the crossbar. 30:12 Free kick awarded for an unfair challenge on Charlie MacDonald by Ryan Green. Direct free kick taken by Marcel Eger. 27:51 Stuart Fleetwood gives away a free kick for an unfair challenge on Shaleum Logan. The free kick is swung in right-footed by Sam Saunders. 26:11 A cross is delivered by Robert Purdie, clearance by Jonathan Douglas. 25:59 Robert Purdie crosses the ball, clearance made by Shaleum Logan. 22:18 Free kick awarded for a foul by Kenny Lunt on Sam Wood. The free kick is delivered right-footed by Sam Saunders from left channel. 21:55 Unfair challenge on Marcus Bean by Harry Pell results in a free kick. Simon Moore takes the free kick. 21:47 The ball is swung over by Joe Colbeck, clearance by Karleigh Osborne. 20:27 James McQuilkin produces a cross, save made by Simon Moore. 18:49 Unfair challenge on Clayton Donaldson by Ryan Green results in a free kick. Sam Saunders crosses the ball, Karleigh Osborne takes a shot. Save by Adam Bartlett. 16:51 Shot from just outside the box by Jonathan Douglas goes over the bar. 16:22 The assistant referee flags for offside against Stuart Fleetwood. Karleigh Osborne restarts play with the free kick. 15:38 The referee gives a free kick against Kenny Lunt for handball. Indirect free kick taken by Karleigh Osborne. 14:16 The ball is sent over by Sam Wood. 13:35 Shaleum Logan takes a shot. Save made by Adam Bartlett. 13:26 Kevin O'Connor crosses the ball. 10:19 Sam Saunders fouled by Kenny Lunt, the ref awards a free kick. Sam Saunders takes the direct free kick. Correction - 10:05 Marcus Bean takes a shot. Ryan Green gets a block in. 10:05 Marcus Bean takes a shot. Robert Purdie gets a block in. 9:45 Clayton Donaldson takes a shot. Adam Bartlett makes a save. 7:36 Free kick awarded for a foul by Charlie MacDonald on James McQuilkin. Kenny Lunt takes the direct free kick. 6:47 Free kick awarded for a foul by Charlie MacDonald on Joe Heath. Free kick taken by Joe Heath. 5:02 Marcus Bean takes the indirect free kick. Sam Saunders takes a shot. Harry Pell gets a block in. 4:26 The ball is swung over by Shaleum Logan, clearance by Robert Purdie. 2:51 Jonathan Douglas challenges Harry Pell unfairly and gives away a free kick. Kenny Lunt restarts play with the free kick. 1:36 The referee blows for offside against Clayton Donaldson. Ryan Green takes the free kick. Correction - 0:53 Corner from right by-line taken by Sam Saunders. 0:53 Clayton Donaldson takes a outswinging corner. Correction - 0:39 Sam Saunders takes a shot. Save by Adam Bartlett. 0:39 Clayton Donaldson takes a shot. Save by Adam Bartlett.